Add 1 “Crystal Beast” monster from your Deck to your hand, and place 1 “Crystal Beast” monster with a different name from your Deck face-up in your Spell & Trap Zone as a Continuous Spell. You can only activate 1 “Crystal Bond” per turn. Guess they are still trying to give Crystal Beasts support in 2018…more LV support please, lol. Crystal Bond is the RoTA for Crystal Beasts, but also fills a spell/trap zone with a Crystal Beast from the deck. Thin the deck double-time and set up your plays in one card that doesn’t cost anything, I’d say this is a card the deck wants in 3’s. The search is great, any Crystal Beast is able to be searched. Set up your Ruby Carbuncle or Sapphire Pegasus plays, fill requirements for cards like Crystal Beacon, Crystal Abundance, or fill a slot for cards like Ancient City. This card’s second effect is like Crystal Release, but the search effect is much more useful than an added 800ATK as Release is an Equip. Good support for the archetype. Crystal Abundance is still the win condition for this deck though. I feel ok about this card. Crystal Bond is a free once per turn Normal Spell Card that lets you put a Crystal Beast in your hand and a differently named one on the field. While it is perfect for Crystal Beasts and should be run in triplicate, it is not ROTA. ROTA searches a type that can be use in any deck that runs some Warriors, a well supported type. Crystal Bond would be better if there was some kind of Crystal Engine, maybe in Mekk-Knights or something. Anyway, this card is really good, and other archetypes would kill to have it. Own three because they are so cute. Though I did pick this card due to the amazing artwork, Crystal Bond is actually amazing for Crystal Beasts. 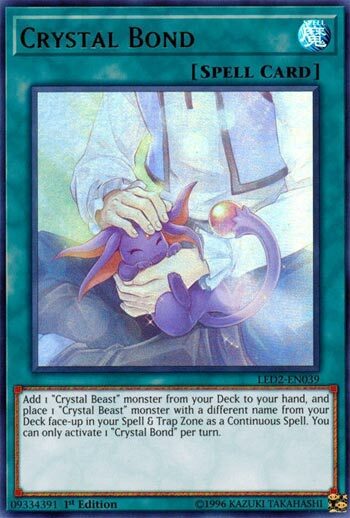 Crystal Bond is a Normal Spell that lets you add a Crystal Beast monster from the deck to the hand and then place a Crystal Beast monster from your deck into the Spell and Trap zone. Seriously, this is everything Crystal Beasts need, a searcher and another way to get Crystal Beasts into the Spell and Trap zone. You are most likely searching Sapphire Pegasus with this and putting Ruby Carbuncle into the Spell and Trap zone. Sapphire gets you to more Crystal Beasts and Ruby lets you summon more Crystal Beasts from the Spell/Trap zone when it is Special Summoned. Also, this spell is searchable thanks to Rainbow Bridge. Crystal Vanguard searches it as well, but for some reason the TCG still doesn’t have that card for some reason, along with Crystal Protector and Crystal Hoard, and Crystal Beasts in the TCG would really love to have Crystal Hoard. All of that aside, Crystal Bond is great for Crystal Beasts, though there are only 2 really good ones. The others are either ok or terrible, but you still play copies of them depending on how you feel and if you want to summon the Rainbow Dragons. Art: 5/5 Seriously, it is so adorable. Jessie really loves Ruby Carbuncle. Crystal Bond does what it does well for Crystal Beasts. The first thing worth noting about this card, is that it’s a +1. Hell, at least a +1. It’s one of those +1 that can easily turn into a much larger advantage for you, and likely on the turn you play it. You get to add any Crystal Beast to your Hand, and then place a separate one (so long as it’s of a different name than the one added to your Hand) in your Magic/Trap zone. Only one can be activated per turn, but that’s okay. Crystal Beasts are a tremendously quick Deck. This is a great advantage card but remains one without being broken. You play Crystal Beasts, you play this. Art: 5/5 That’s clearly Jesse (even though we don’t see his face) and the picture is just adorable. Ruby is very happy in this picture.